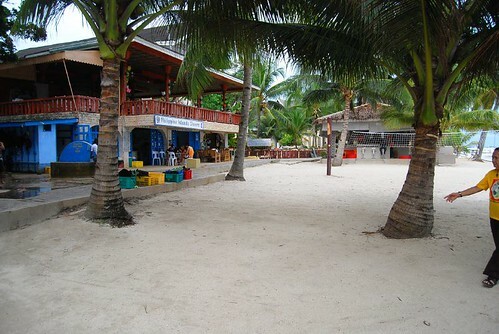 Alona Beach at barangay Tawala of Panglao Town is a favourite tourist destination. The increasing influx of visitors to the beach and to the island of Panglao itself has seen the setting up of many resorts, dive shops, restaurants and bars. Below is a comprehensive list of resorts and hotels located at Alona Beach. Another separate listing has been made of the hotels and resorts of the town of Panglao not located at the beachfront. Alona Dream at Alona Beach has five (5) room accommodations. 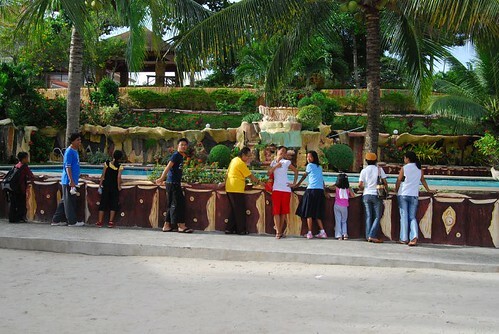 The Alona Dream Resort is located at barangay Tawala. Another branch is at Danao, Panglao. It has its own beauty, health and spa services. Alona Tropical Beach Resort is under Philippine management. The resort offers 27 double rooms, 10 of them are located in a longhouse while 10 are bungalows. The resort has a swimming pool with Jacuzzi and a restaurant. Alona Vida Beach Resort offers eight (8) deluxe rooms in two (2) two-storey buildings made of a mixture of native and modern materials, such as bamboo, nipa leaves for roofing, local hardwood, and cement. 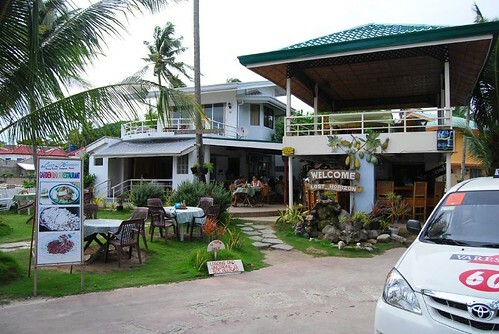 Aside from air-conditioned accommodations, the resort has its own bar & restaurant, a dive center, and swimming pool. Also, guests are treated to a wireless LAN Internet connection (WiFi) free of charge. Alona Ville Resort rents out simple cottages with fan and rustic rooms with common bath. The cottages with patios can hold 4-5 people. The resort has a swimming pool, set romantically in a natural hollow, connected to caves about three to four meters below the garden. It is located near the Alona Kew White Sands Beach Resort. It has a bar and restaurant named Tom & Gerry’s Bar. Aquatica Beach Resort The resort offers six (6) air-conditioned rooms and ten (10) fan rooms housed under a two-storey, all-concrete structure. It has its own restaurant serving a la carte meals while 3 restaurants are beside it. A dive shop is within its compound offering courses from Open Water to Instructor. Beach Rock Cafe is situated right at Alona Beach, the first establishment you will see on the right when you step off your ride at Alona Beach. It is in front of Alona Kew Resort. The resort has 7 single rooms which are provided with electric fans and private toilet and bath. Bohol Divers Resort The facilities are above par with 42 cottage-type rooms and other high grade hotel-like rooms; all with fans or air-conditioners. The resort offer diving services, and has a swimming pool, an outdoor restaurant/bar which serves good food. Casa Nova Garden has cottages provided with fan or air-conditioner and situated in a lovely garden with a rectangular swimming pool and a restaurant. There are 13 rooms in two categories: double aircon and double non-aircon; all with private toilet and bath. It has a restaurant and bar, swimming pool, billiard and table tennis paraphernalia and scuba diving facilities. Charlotte Divers Resort is a beachfront resort situated at the end of Western Alona. This is a beautiful resort operated by a Korean. The resort offers budget rooms with sea view and a diving center. Isis Bungalows Under Swiss supervision, the resort boasts of 12 room accommodations in the following categories: family bungalows, deluxe bungalows, standard bungalows, and standard rooms. All rooms are equipped with private toilet and bath and have their own terraces with a panoramic view of the sea. Linaw Beach Resort offers luxurious rooms: a double king, double twin, family and suite rooms; all with private balcony, air-conditioned with ceiling fans, hot & cold shower, bath tub, and refrigerator. The resort has an infinity pool, a pool bar and a restaurant. Lost Horizon Resort has 20 rooms with interiors luxuriously decorated. It has an excellent garden restaurant and bar with staff that are warm, friendly and very efficient. Diving services are available at “Nautilus Diving”. The resort offers DSL free internet, satellite TV in every room, IDD phone, fax and email services. Peter's House is directly situated on a beachfront. The house is made of bamboo and other native materials with five rooms and a common bathroom. The place is associated with Genesis Divers. Pyramid Beach Resort is identifiable with their cottages having unique angular architectural designs with overlapping nipa-woven roofing of extended leaves. The resort offers two-storey cottages with standard bedrooms located on the 2nd floor and a receiving/sitting area on the ground floor. Air-conditioned and fan rooms are available. Playa Blanca This is one of the pioneer resorts in Alona Beach. There are about 5 duplex cottages made of bamboo and other native materials with rooms provided with basic facilities like beds, closet, table and a bathroom. One can either use a fan or an air-conditioner at specified rates. Oops Cottages offers native-style cottages for low and medium budget travellers. With the Oops Bar & Restaurant, guests are treated to a wide variety of Filipino and European dishes and the most extensive selection of drinks and spirits. 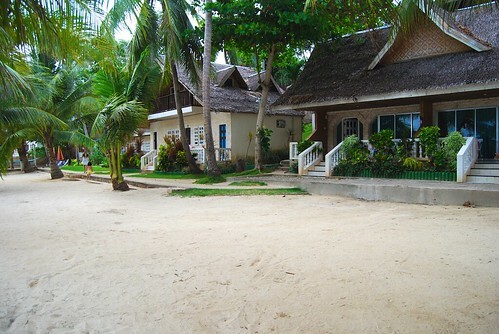 Rene's Place is located at Alona Beach, Panglao Island, Bohol, Philippines. It is a two-room resort with an interesting bakeshop. 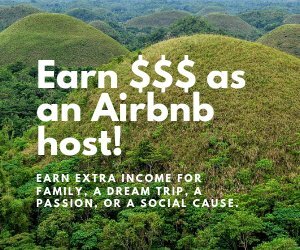 3D2N twin sharing is available upon request. 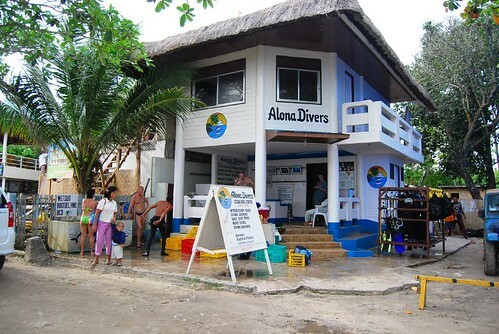 Sierra Madre Divers Dive Center is located right at Alona Beach at Panglao Island. The Center offers standard air-conditioned rooms at 31.00 USD. Swiss Bamboo House The resort boast of 7 rooms and has a fully equipped dive shop and a restaurant that serves Filipino and International cuisine especially German dishes. It is owned by Manfred “Manni” Slowik, a German, and his Filipino wife, May. Tierra Azul Alona Beach House offers 9 rooms in the following categories: double aircon and double non-aircon with private toilet and bath. Non-aircon rooms are provided with fans. The resort is only a few steps away from Alona Beach. The resort is owned by a Filipino couple who hails from Panglao town. 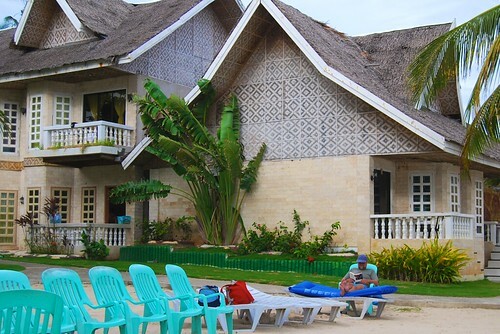 Tom’s Sun Resort is located at Alona Beach, Tawala, Panglao. Trudi’s Place offers 9 rooms: 4 of them have sea view and 5 have a view of the rear of the resort. All rooms are air-conditioned and equipped with hot and cold shower, cable TV, king-sized bed complete with beddings, blanket and pillows. Aside from the rooms, the building houses a bar and a dining area. 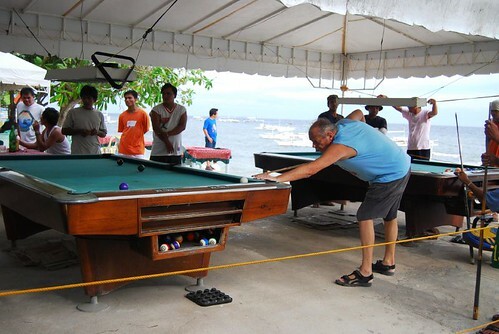 Bohol Dauis Hotels and Resorts Pension Houses, Inns and other establishments offering room accommodations are only few in comparison to those found at Alona Beach yet their clientele have grown. Panglao Island Hotels - offers cottages, bungalows and two-storey houses offering room accommodations that are fully equipped with beds, aircon, private bath, hot and cold water, etc. Panglao Island Beach Resorts offers Continental, Filipino and English cuisines served by well-trained staff. Amidst trees and Bermuda grass is a swimming pool. Alona Beach Resorts and Hotels are famous for its coral white sand that stretches one and a half kilometers and ends in rocky cliffs at both sides. Find your hotels here.